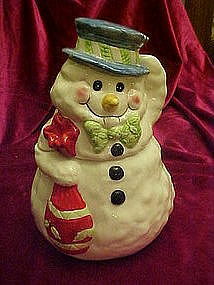 A sweet cheery face snow man holds a big red bag of Christmas fun! The bag is trimmed with holly, and he wears a green bowtie made of holly and a big blue hat. Made of hand painted ceramic and measures 11 1/4" tall. There is a chip under his hat that is hard to see because it has been repaired and painted. He is very adorable.